The world's first ONE-HANDED, AUTOMATIC HAMMER! 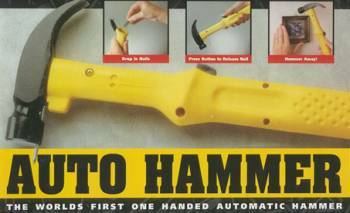 The world's first ONE-HANDED, AUTOMATIC HAMMER! The handle holds up to 20 nails and accepts nails with a minimum head size of 3.8 mm, and maximum head size of 5.2 mm. While holding the hammer at a 45 degree angle, depress the release button, and a nail will automatically drop down the handle and be magnetically held in the head! Make all your hammering projects faster, easier, and safer!